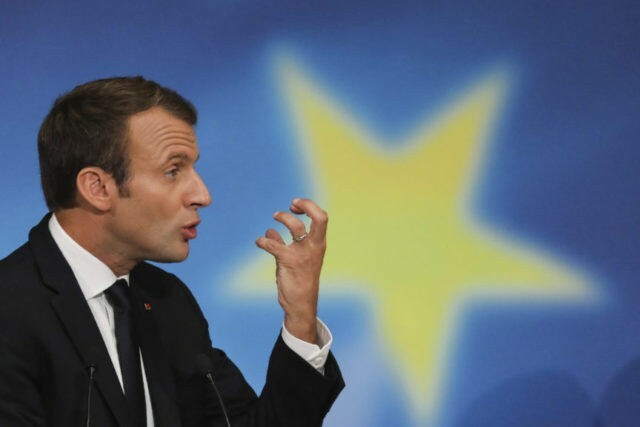 PARIS (AP) — Calling Europe slow, weak and ineffective, French President Emmanuel Macron on Tuesday said the EU should embrace a joint budget, shared military force and harmonized taxes to stay globally relevant. “We thought the past would not come back … we thought we had learned the lessons,” Macron told a crowd of European students at the Sorbonne university Tuesday as he seeks to make France’s mark on Europe’s future. “The Europe that we know is too slow, too weak, too ineffective,” he said. To change that, he proposed a joint budget for European countries sharing the euro currency that would allow investment in European projects and help stabilize the eurozone in case of economic crisis. This budget would at some point need to come from national budgets of countries sharing the euro currency, for instance using domestic taxes on businesses. While re-elected German Chancellor Angela Merkel has signaled openness to some of Macron’s ideas, one potential ally in her new government is deeply skeptical about a eurozone budget. Macron’s office says he wants his Europe strategy to play a role in Germany’s coalition-building talks. The euro has fallen steadily since news that Merkel won the German national election with a weakened hand. To reduce inequalities across the EU, Macron also suggested greater harmonization of EU tax policies — notably on corporate taxes, and taxing internet giants where they make money and not where they are registered. Macron is also proposing that every EU country guarantee a minimum wage and payroll charges. Macron said, “I believe deeply in this innovation economy,” but insisted that “we must have this debate” about making taxation more fair. Macron also proposed a shared European military intervention force and defense budget. He suggested the creation of a European intelligence academy to better fight against terrorism, and a joint civil protection force. He wants to open the French military to European soldiers and proposed other EU member states do the same on a voluntary basis. To deal with Europe’s migration flux, Macron wants a European asylum agency and standard EU identity documents. Macron’s policies have met resistance at home, and riot police held back a few dozen protesters outside the Sorbonne. Macron doesn’t want to wait for Britain to leave the EU in 2019 to tie European economies closer together. He’s well-placed to kickstart those efforts: at just 39, he came of age under the EU, and won a strong electoral mandate this year. And he’s already held one-on-one meetings with 22 of the union’s 27 other leaders to market his EU strategy. His biggest challenge may be the German political calendar. The outgoing government goes into caretaker status in a few weeks and is not going to be taking any major decisions on the future of Europe, and it may take months for Merkel to form a viable coalition. The pro-business Free Democrats, a key potential partner for Merkel, is against a joint budget because the party says that would result in automatic, uncontrolled money transfers from Germany to struggling eurozone partners. Merkel herself said Monday she wouldn’t rule anything out and that she is in touch with Macron about his plans. “What is important to me above all is that we could use more Europe, but that must lead to more competitiveness, more jobs, simply more clout for the European Union,” she told reporters in Berlin.